No fair! Every time I've been there, it's been bucketing down! 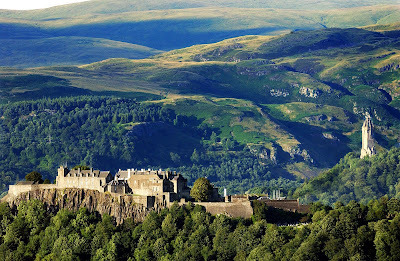 Oooh..I love Stirling Castle. I went there about six years ago. It's a must see for those who love castles and such. Plus, there's a William Wallace monument close by to trek up and see. (I believe that's it in the upper righthand corner of the picture). Thank you for posting it! Wow, how beautiful. I'd sure love that view every morning. I've heard of this one, it being mentioned several times in particular with my Queen of Scots reads, but it has a fabulous history with the Stewarts/Stuarts and even earlier than that! Wouldn't mind visiting this one either!